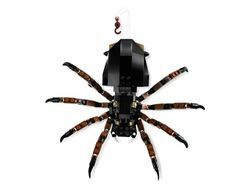 Shelob is a brick-built giant spider introduced in The Lord of the Rings theme in May 2012. Shelob was a gigantic spider, the "last living child of Ungoliant the Great". She lived in a tunnel high above Minas Morgul. Sauron was aware of her, and used her to guard his border. When Gollum brought Frodo to the tunnel, Shelob attacked and stung Frodo, paralyzing him, and wrapped him in a cocoon. After Sam found him, he managed to wound Shelob after a fight, and she retreated back into the tunnel never to be seen again.